The X.Org project provides an open source implementation of the X Window System. From Wikipedia, the free Encyclopedia, article X Window System, design. 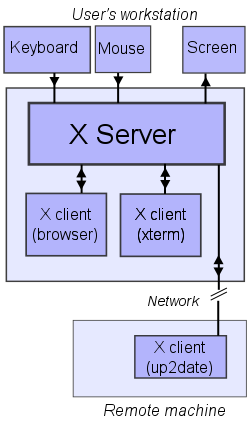 An example deployment of a X server. This client–server terminology — the user's terminal being the server and the applications being the clients — often confuses new X users, because the terms appear reversed. But X takes the perspective of the application, rather than that of the end-user: X provides display and I/O services to applications, so it is a server; applications use these services, thus they are clients. Η σελίδα αυτή τροποποιήθηκε τελευταία φορά στις 2 Σεπτεμβρίου 2012, στις 20:01. Αυτή η σελίδα έχει προσπελαστεί 1.378 φορές.